It’s a perfect workspace for a creative mind – one where she can draw inspiration while gazing out the window toward a small forest. As Superior Automotive Group’s marketing coordinator, it’s her job to give the company’s 13 dealerships an online presence as well as coordinate events that benefit the community. She takes photos, shoots video, posts on social media and responds to online comments, always making sure the customer is satisfied. She has a lot of responsibility as Superior Automotive’s first marketing coordinator and online voice. In fact, it was her job to create a plan and strategy. “It shocked me how much they trusted me,” she says. Udouj drew from her Integrated Marketing Communications class taught by marketing Clinical Assistant Professor Anne Velliquette. Students were assigned to come up with a marketing plan for a start-up backpack company. The class broke up into teams of four as they researched the customer demographic, came up with branding and explored ways to sell the backpacks. She approached Superior’s marketing plan no differently. “That was a great foundation, stepping into this job,” she says of Velliquette’s class. She was hired in June 2017 – the same year she graduated from the Walton College with a marketing degree. Now she’s focused on giving Superior Automotive’s dealerships an online presence. While most are located in Northwest Arkansas, Superior also has dealerships in Conway and Tyler, Texas. My family consists of: my father, mother, sister and brother. I have two nieces, and I’m recently engaged! My first car was a: 2001 Lexus ES 300. If I were on a space station and could bring only three items, I would bring: a deck of cards, a record player and a good book. My favorite outdoor activity is: running. I’ve run three half marathons in the past few years and they’ve taught me self-discipline and the importance of persistence. My childhood hero was: Dorothy from “The Wizard of Oz.” Not sure if she would be classified as a hero, but when I was younger, I’d dress up as her every chance I got. Smooth peanut butter or crunchy? Smooth!!! I can always be found with: sadly, my cell phone! The best part of her job is visiting the dealerships with her camera in tow, which allows her to be creative, Udouj says. This enables her to celebrate with customers the life event of buying a car or truck by posting their stories on Facebook and Instagram. Sometimes someone receives a surprise of a new car and that can be especially enjoyable. “Making customers happy is really fun to see,” she says. Udouj also helps with Superior’s community service, such as a Cars and Canines program where people can adopt a pet from the local animal shelter and receive a perk, such as a free oil change. Dealerships have also held “trunk or treat” events for children during Halloween, she says. Internally, Superior has an employee of the month at each of its different locations, and Udouj is there to spread the good news. Spotlighting these star associates can also inspire others, she says. To do her job daily, she must be a self-starter as well a self-learner should she need to pick up a new technical skill, like editing a video. “I have to figure out what I’m going to do and do it,” she says. Udouj, who grew up in Fort Smith, says she always wanted to be a Razorback and attending the University of Arkansas was a natural choice. 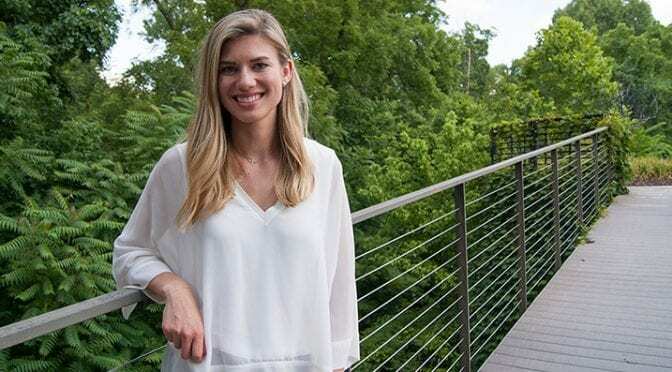 She says she applies to her current job the real-world experiences from her Walton classes, including a marketing research project where students collected data from customers at a local barbecue restaurant. She also volunteered her marketing skills with the Razorback Foundation. In her spare time, Udouj enjoys running – she has completed three half marathons – and loves to sing anything from Broadway musicals to country. She’s also engaged to Kile Graves, who is director of operations with Bearded Goat Apparel. Like Udouj, he is a Walton graduate but with a degree in supply chain management. She has also returned to Walton to participate in career fairs – Udouj says Superior offers opportunities in accounting, finance, marketing and other areas – and speaks to students. Her message to those interested in working in marketing: take some liberal arts classes in addition to business courses. Photography and journalism will enhance social media skills, she says. Udouj also stresses that students shouldn’t second-guess their talents when employers offer them jobs. “If someone sees potential in you, go ahead and take that risk and do it,” she says.